Almost two months after Grace first turned wolf, things in Mercy Falls start heating up. Isabel finds out her father has succeeded in getting the wolves off the protected list of animals, and is pushing for an aerial hunt. Grace infrequently turns human, but not long enough for her to meet with Sam, who misses her desperately. Cole, meanwhile is attempting to find a cure for the werewolf disease, but first, he’s trying to figure out what it is that makes them turn in the first place. Shelby kills Olivia when she’s just turned human, and suspicion falls on Sam, since her body was found few yards from Back’s property. The aerial hunt is sanctioned. 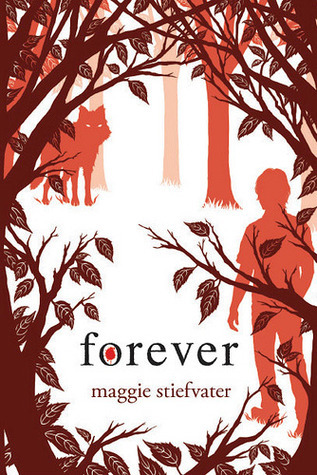 Sam, Cole, Isabel and Grace decide that the wolves need to be moved from Boundary Woods, and soon. Officer Koenig believes that Sam is innocent and invites him to confide in him. When Sam tells him of their dilemma of where to move the wolves, he offers his property, a peninsula some ways off Boundary Woods. They find out from Beck how to persuade the wolves to move out of the woods. The hunt is moved up suddenly, and they have a scant few hours to direct the wolves out of the woods and to the peninsula. They succeed in saving the wolves, but in the process, Beck and Shelby are killed, and Cole is hit. When they return for Cole, they cant find him. Later, he calls Isabel and tells her he’s fine. Isabel is being sent to California. Grace completes high school, turns 18, and moves out of the house. The story opens with Shelby killing a young girl in the woods. Grace is now a young wolf who frequently turns back human for short snatches of time, It’s now almost two months since she escaped from the hospital after Cole & Sam helped her turn. One day, she finds herself a human at the edge of Boundary Woods, nowhere near Mercy Falls, and calls Sam, but before he can get to her, she turns back and disappears into the woods again. Isabel finds out that her father is attempting to get rid of the wolves in Mercy Fall for good by getting them off the list of protected species, and goes to warn Sam. Isabel and Sam find Cole in wolf form on the floor of Sam’s kitchen, having a seizure. They find an empty syringe next to him, and come to the conclusion that he was trying to commit suicide. After they help him recover, Isabel storms off. In truth, Cole is attempting to discover a cure for whatever it is that makes them turn into werewolves, and is experimenting them on himself. The next time Grace comes to, she’s near Isabel’s house, and goes to her for shelter. Upon hearing about Isabel’s father’s efforts to erase the wolves, she suggests that they move them elsewhere. The police find Olivia’s body in the woods, mauled by wolves. When Shelby finds (human) Grace in the woods one day, she starts chasing her. Grace stumbles and falls into a sinkhole filled with freezing water. The temperature pushes her body to turn, but she knows that if she does, she will no longer be able to swim. But then she starts feeling her skin change. Isabel’s father succeeds in getting the wolves off the protected list and arranges for an aerial hunt. Sam and Cole decide to get the wolves out of the woods. They dont know how yet, but do know that they have to try. They set out to trap Grace. When they catch a scent and begin following it, it leads them to her, deep down the sinkhole, almost fully submerged under water. Sam and Cole save her and take her back to Sam’s house, where she turns human. They begin devising a plan to get the wolves out of the woods. Cole tells the others of how Beck first brought the wolves to Mercy Falls from Wyoming – with the help of a werewolf named Hannah who could hold human thoughts in her wolf form. They decide that one of them will lead the wolves out of the woods. Sam comes under suspicion for Olivia’s murder, given his history and that she was found near Beck’s property. Officer Koenig is the only one who seems to believe he’s innocent, but knows he’s not completely ignorant. He tells him to come clean with him so he can help them. Sam tells Koenig everything. He tells him their plan to move the wolves elsewhere. Koenig offers the use of his property, a peninsula some ways off Mercy Falls with lots of trees for cover. However, they require more information on moving the wolves, for which they need Beck’s help. Cole figures out a way to turn Beck back into a human for atleast a short span of time. They catch Beck, turn him, and he tells them how to direct the wolves to the peninsula. Grace reveals her secret to Rachel and they go together to Grace’s parents’ house, where she reconciles with her parents and tells them she’s moving out. Soon after, Grace turns again and returns to the woods. That night, Isabel finds out the aerial hunt has been moved up thanks to her father’s influence. She alerts Sam & Cole immediately and heads over to help. Cole injects Sam with a mixture that triggers the change, and Sam goes into the woods to find Grace and the rest of the pack. He first finds Grace and with her help gathers the rest of the pack, leading them out of the woods. Cole stays human in order to relay messages to Sam and monitor the wolves progress. When the sun rises, the helicopters come. Shelby starts trying to hinder Beck’s progress. When Sam turns back to deter her, she attacks him. Beck is killed by the first bullet from the hunters. Cole turns into a wolf, and enters the fray. He forces Sam to leave, engaging Shelby himself. As they are struggling, a volley of bullets hit Shelby, and she falls. A second later, so does Cole. Isabel, in her SUV sees the whole thing and swerves her car onto the snow, right into the pack of wolves, forcing them to move faster, and helps them escape the hunters. Sam and Grace lead the wolves to Koneig’s peninsula, where they are no longer hunted. When they go back to recover Cole’s body, they cant find him. Some days later, Isabel gets a call from him, saying he’s alive and well; just recovering. Isabel’s parents are sending her to California for her interference during the hunt. Grace lives with her parents during the summer, completing high school, and then moves out to live with Sam, telling them she’s going to Norway with Rachel (who is going there for real). Grace decides to take an injection of meningitis-tainted blood, like Sam did earlier. According to Cole’s theories, if Grace was able to fight off the meningitis as a wolf, it would slowing fight the werewolf inside her too and make her human for good. So she turns, for the last time. I want to keep reading! But the story ends here. Cute little v series to get utterly and completely lost in. Highly recommended! !